The Yerkes National Primate Research Center at Emory University is home to many scientists whose work sheds light on the question of just what the human spark might be. 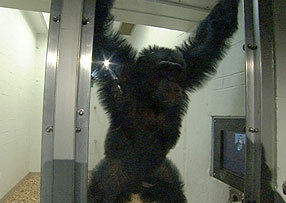 Lisa Parr is one of the experts who welcomed the Human Spark crew to her lab – which in her case includes chimpanzees. Here she explains what she is investigating with her chimpanzee subjects and what it was like to participate in the filming. When they aren’t distracted by unfamiliar camera crews, the chimps Lisa works are quite good at calmly working on computer games. It’s always a little nerve wracking when people come to visit the chimps. Despite the fact that the chimpanzees I study are extremely well-trained, follow simple verbal instructions, and would perform most of our tasks without the small amounts of sugar-free Kool-Aid that we give them as reinforcement (because they are fun), they are still powerful, wild animals with their own free will. You can almost never get a chimpanzee to do something it doesn’t want to do: they are too big, too strong, and almost certainly too smart. And if Murphy’s Law has anything to say about it, when you do want them to do something, you are definitely out of luck if there is a camera crew involved. 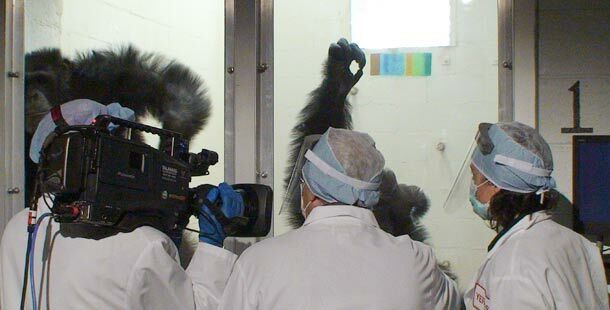 Such is the situation when Alan Alda and the Human Spark filming crew recently visited my lab at the Yerkes National Primate Research Center in Atlanta, Georgia. Lisa and Alan observe a chimp working on a facial expressions task. The animal is looking at computer-generated faces like the one on the screen beside them. In my research on social cognition, I am interested in what kinds of information chimpanzees garner from faces. Can they tell different individual chimpanzees apart if presented only with their faces? Do they recognize different categories of facial expressions, and if so, how? Ultimately, my lab is interested in drawing parallels between human and chimpanzee facial expressions and the extent to which they may be involved in communicating about emotion. 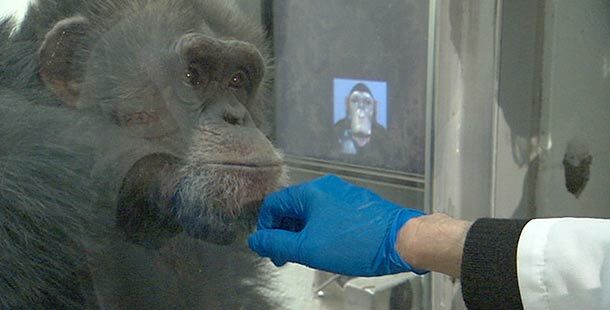 To do this, we have trained six chimpanzees to discriminate images on a computer monitor by selecting those that match using a joystick-controlled cursor. We have shown that chimpanzees discriminate faces and facial expressions much like humans do, using the entire configuration of facial features, and particularly features related to the shape of the mouth. While this might sound like it’s straight out of the movie Project X, the chimpanzees actually learn this task very quickly and perform extremely well, even when we make the tasks quite challenging. Well, that is to say on a typical day. On this day, however, two large male chimpanzees (that have been part of my research program for almost 15 years) were confronted by several unfamiliar men holding expensive video equipment. To compose the scene (the producers thought it was a good idea at the time), Alan and I were positioned directly in front of the 1 ¼ inch thick Plexiglas window that separates the chimpanzee portion of my testing room, where the chimpanzees have their own computer, from the human-tester portion of the room. We had unintentionally created what Alan later referred to as his “King Kong moment” (forgetting for now that King Kong was actually a gorilla). The chimps were more interested in being tough guys in front of the film crew than doing their usual computer tasks. You see, chimpanzees are extremely territorial in the wild. So, instead of sitting and diligently showing off their computer-skills, as they would on a regular day, these two chimpanzees did what any self-respecting male chimpanzee would do: try and intimidate the group of strangers with their characteristic bluff-display. Such a display consists of chimpanzees standing bipedally (on both legs), puffing out their hair (piloerection), swaying back and forth, charging at the offending parties, hooting and screaming loudly, and throwing any objects that are within reach. These displays are demonstrations of sheer power and, in the wild, males use them to reinforce their dominance, intimidate rivals, and aid in coalition formation. I’ve seen these displays so often that I sometimes forget how awesome they are, not to mention when there is only 1 ¼ inch of Plexiglas separation between us! Needless to say, Alan and I survived, although the chimpanzees won this contest (again), and the cameraman’s skills prevailed as his nerves were tested holding the camera steady despite the large, blurry black figures jumping back and forth in his lens. So, for the rest of the afternoon, instead of working quietly on their tasks, the chimpanzees frolicked and played, occasionally returning to remind us of who was in charge, and Alan and I were finally able to discuss chimpanzees, facial expressions, and the challenges researchers are faced with when trying to understand cognitive abilities in other animals.